A Tale Of Two Talks: Ted Cruz Outlasts Rand Paul By 8 Hours : It's All Politics At 21 hours and 19 minutes, the Texas Republican held the Senate floor for considerably longer than Kentucky Republican Rand Paul did in March when he staged an actual filibuster over the country's drone policy. 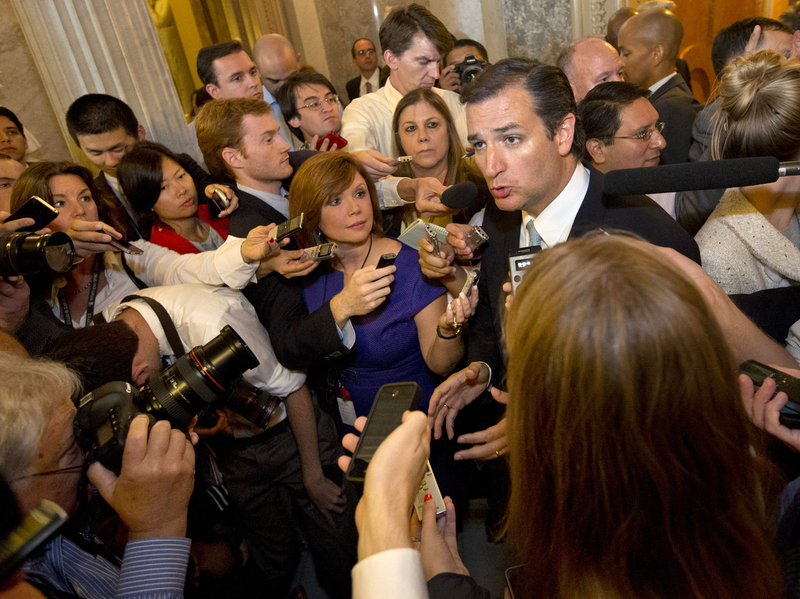 Republican Sen. Ted Cruz speaks to the media Wednesday after delivering a marathon Senate floor speech. OK, so it wasn't a real filibuster, as no Senate action was actually blocked or delayed. But Texas Republican Ted Cruz's talk-fest did succeed in one key measure: duration. At 21 hours and 19 minutes, Cruz held the Senate floor 8 hours and 27 minutes longer than Kentucky Republican Rand Paul did in March when he staged an actual filibuster over the country's drone policy. In light of how much positive buzz that 2016 presidential hopeful won, Cruz's performance should translate into considerably more presidential hype, right? To be precise about it, 65.67 percent more, right? It's not a question that the Texas senator will answer. When asked about 2016, Cruz consistently answers that he's focused on his present job. Nevertheless he, like Paul, has made a hobby of visiting early presidential primary states, and many political observers expect Cruz to run for the GOP nomination three years from now. All of which could mean an even longer floor speech from Florida's Marco Rubio — another senator with a conservative grass-roots following — is probably right around the corner.